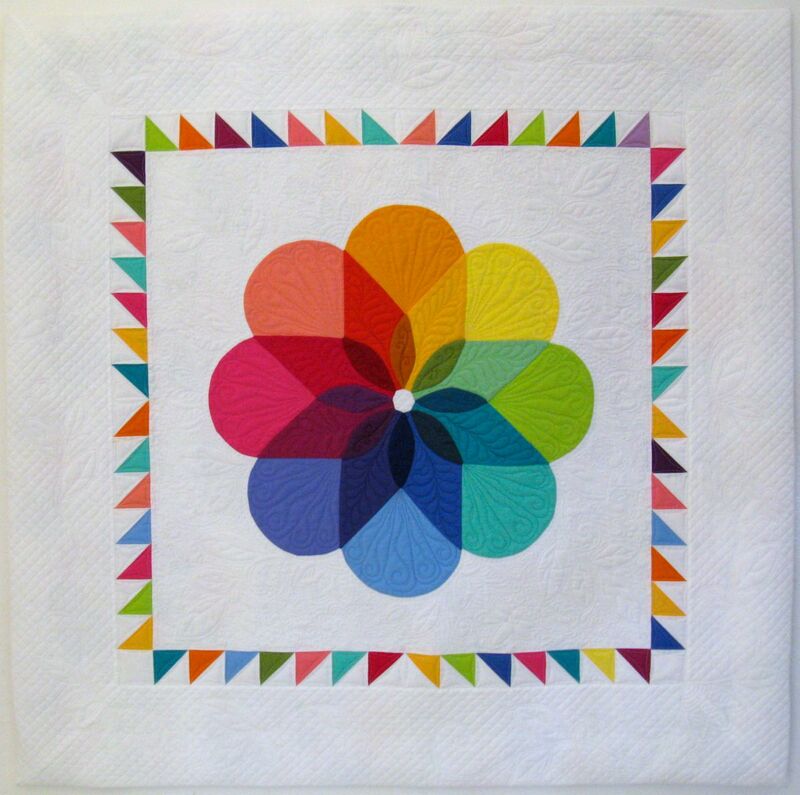 Colorwheel Blossom–Blogger’s Quilt Festival | OccasionalPiece--Quilt! 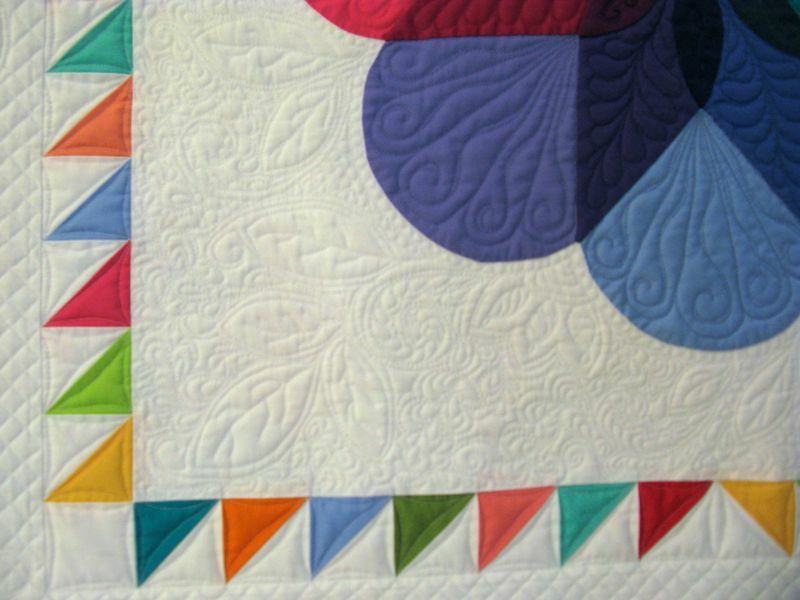 Posted on May 15, 2015 by Elizabeth E.
Welcome to the Blogger’s Quilt Festival! I’m entering ColorWheel Blossom in the ROYGBIV category of Amy’s online contest. It took me forever to find the right colors for the center of the blossom, and I haunted several quilt show booths, combing through their Kona Cottons to find just the right shades, then visited Purl Soho–Irvine to get the right inner petal shades. I appliquéd it to the white background, and then it took me several months to get up the courage to quilt this. I settled on a curvilinear emphasis in the middle field and an angular emphasis in the borders. It now hangs in our hallway right by the front door, a rainbow greeting all our guests, lighting up our home. Thanks for stopping by to see Colorwheel Blossom. Be sure to head back to Amy’s Blogger’s Festival to see the rest of the quilts, and to vote for your favorites! Voting begins May 22nd for each category, as well as Viewer’s Choice. Gorgeous and I love the quilting! Oh my! So beautiful! I love it! I’ve always liked this one. It’s so cheery and your quilting is wonderful. Hope some day I can see it hanging inside your front door. You really hit the colour wheel perfectly! I wish I could see this in real time, VBG. Love the transparancy from yellow…nail on the head! What a clever design. I love the bits where the petals overlap and you’ve got a different shade in there.Very effective. I love this one! The layering is fantastic, and the quilting is gorgeous! what a lovely quilt! 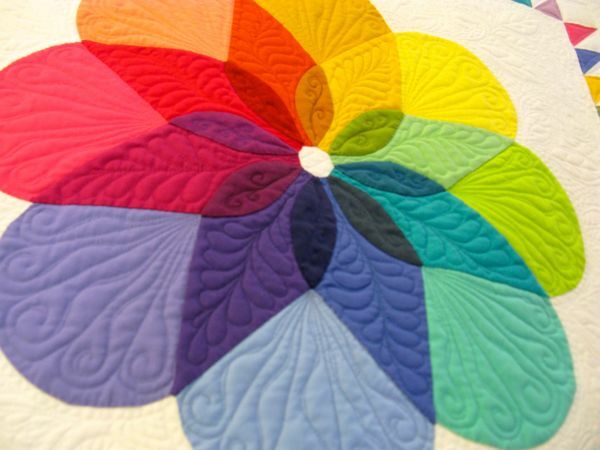 I love your choice of colours and the quilting is beautiful! It’s just fabulous – I love it and the quilting -OMG! Stunning. Awesome piece. I am so glad you shared this quilt in the festival. I believe it’s one of my favorites of yours! 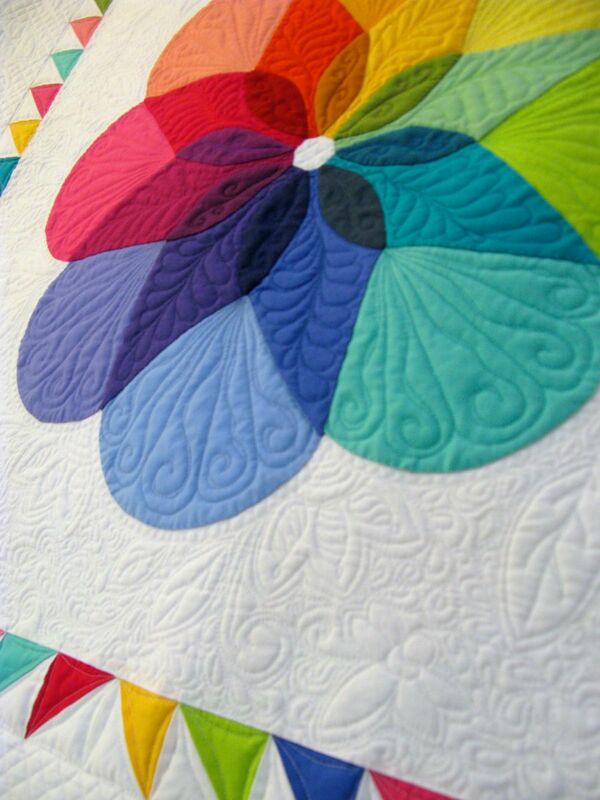 I love the colors, the design, the layout and the quilting! So beautiful!